Before departing on a new adventure it’s important to make sure you have everything planned and in place before boarding the plane. From travel documents to booking confirmations, here is our personal checklist of items we complete before departing to our next destination. If you have any questions, please email us at info@freemadic.com or tweet us @FreemadicLife. 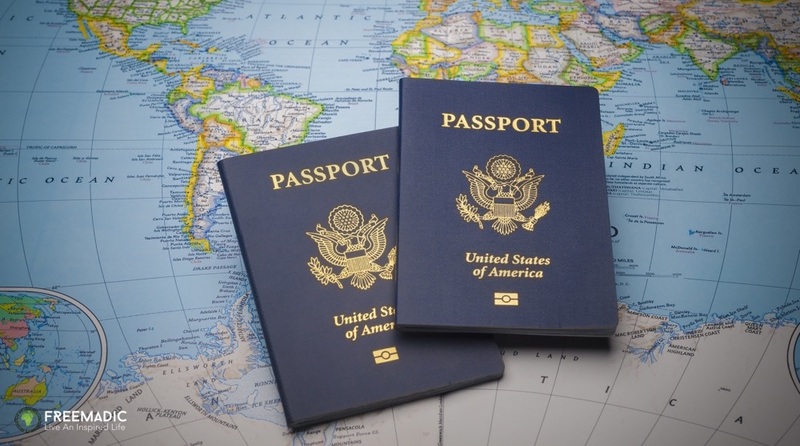 Passport: Make sure that your passport is valid for at least six months after your date of return. Visas: Make sure to have all the visas that you require in order to get access to the countries you’ll be visiting. Visa requirements differ based on your citizenship. Some countries may offer you a visa on arrival, while others might require you to send your passport off to their embassy and even book an in-person appointment. Make sure to get everything you need for your visa application, use a visa agency if necessary, and ensure that your visa length corresponds with the length of your intended stay. Digital Copies: In the unfortunate event of loosing your important documents* or having them stolen, it’s useful having backup copies. We use ScannerPro on our iPhones to scan and create digital copies of all our documents. We then store these copies in our 1Password app on our iPhones and Macs. Hard Copies: Even though we have our digital copies, we alway carry hard copies of all our documents. We make two copies of all our important documents* and keep it in separate places. We’d also recommend that you get all your hard copies certified. * Our important documents are passports, visas, international drivers licenses, bank statements, letter of self-employment from our tax advisor, booking confirmations and insurance documents. Bank Card Authorisation: Not having access to cash while travelling can bring an exciting trip to an immediate stop. Make sure that your bank cards are authorised to work in the countries that you’ll be traveling. Emergency Cash Fund: We also recommend having an emergency fund in cash, ideally in US Dollars, Euros or Pounds. Having this cash on hand can be very useful for unforeseen events. The above mentioned currencies can be exchanged in most (if not all) countries. Mobile Authorisation & One Time Pins: Certain online purchases will require mobile authorisation or a ‘One Time Pin’ (OTP) that gets sent to your mobile number or emailed to you. If you won’t have access to your mobile number from home while travelling, then make sure that a purchase can be authorised some other way, for example by email. Before departing you’ll most likely have a selection of booking confirmations that you will need to take along. These will include flight booking references numbers, accommodation booking confirmations and tour booking confirmations. We save all these documents in our Dropbox as PDFs and favourite them in the Dropbox app on iPhone – this allows us to access the required document quickly from our phones even when we’re offline. Don’t leave home without travel insurance. There are various options when it comes to insurance – these will depend on your citizenship, medical aid/health insurance (if you have that in place), your financial providers and the destinations you’ll be visiting. Insurance by Credit Card Bookings: Various banks and credit card issuers offer free travel insurance when booking an international flight with their credit card. Make sure to enquire about this before booking and follow up to get the correct confirmation documents after booking. Insurance by Medical Aid/Health Insurance Providers: Depending on your provider and plan, certain medical aid/health insurance providers will give you free cover for 30 to 90 days while travelling outside of your country of residence. Make sure to enquire and notify your provider about your travel dates. Also make sure to get a copy of the policy and instructions of what needs to be done in the event of an emergency. Additional Travel Insurance: For long-term travel, when complimentary insurance is not enough, make sure to purchase additional insurance from a company like World Nomads. World Nomads offers extensive insurance available to most nationalities and their website makes it super easy to get a quote and to purchase their insurance while travelling. As our daily lives become more and more entwined and dependant on digital media, WiFi, laptops, smartphones and cloud storage, it’s shocking that many people ignore the importance of their personal digital security. Securing Your Passwords: Save your passwords and sensitive information in a secure system. We use 1Password on our Macbooks and iPhones to store, backup and manage our passwords, as well as other sensitive information. 1Password can automatically create backups using iCloud or Dropbox. Secure Your Phone & Laptop: When on the move you face a higher risk of loosing or having your laptop and phone stolen. Make sure to setup password codes on your devices in the event that your device get’s into the wrong hands. Use a VPN (Virtual Private Network): Subscribe to one of many VPN services and use it when connecting to public WiFi, especially when conducting sensitive transactions like online banking or online purchases. We’ve used VyprVPN, but there are many great options to choose from. Create Regular Backups: Have a backup system in place and make regular backups of your laptop and smartphone. We use Time Machine on our Macbooks to create automatic backups when connecting one of our hard drives to our machines. There are also various online cloud backup services to consider including Carbonite and Crashplan. Two-Factor Authentication: Enable Two Factor Authentication on your accounts and make sure that security features have been filled out and enabled – store all your passwords and important information in 1Passport. We’ve enabled two-factor authentication for Google, MailChimp, Dreamhost, BufferApp, and Dropbox. Your Mobile Number At Home: Before leaving South Africa we made sure to downgrade our contracts to the lowest possible monthly amount (US$3.50 per month) just to make sure we don’t loose our mobile numbers after three months. A Local Skype Number: Before leaving home we purchased a local (Cape Town, South Africa) Skype number for approximately US$4 per month. Anybody in South Africa can call us (from their landlines or mobile phones) using our local number and pay local rates. We can answer theses called directly on Skype or we can set our number to forward to our current foreign mobile phone number wherever we are. That way someone back home can use their phone to call us, pay local rates and reach us on our foreign mobile phone. Skype magic in action! Cancel & Eradicate Unnecessary Monthly Payments: Make sure to cancel any subscriptions, memberships, services or insurance that you will not be using while you are away. Automate Essential Monthly Payment: Make sure to automate the important outstanding monthly payments. Most companies will offer to setup a debit order or deduct the payment from your credit card. Request Physical Postage Via Email: Contact all companies that send you physical mail and request correspondence via email. Most companies will be happy to cut down on postage costs and “save the environment” by emailing you instead.